Documenting the lives of wild ravens. "Raven Rick" Boufford and a young raven at the Grand Canyon. 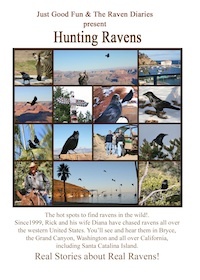 The Raven Diaries, stories for "kids" of all ages who enjoy animals that play! Welcome to The Raven Diaries where all life is celebrated through personal relationships with real wild ravens. Rick and Diana's goal is to share much of the magic and beauty this incredible world has to offer with an ever evolving virtual video diary of the couples numerous experiences with these wildly fascinating birds. 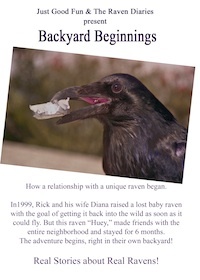 Rick has always had great respect for the raven but in 1999 he and his wife Diana took on the challenge of teaching a 15 day old baby raven to both fly and then return safely back into the wild. Their story "Bob, Huey & Me" was first created as a picture book for family, but soon after Rick began video taping wild ravens for a movie version to be put on DVD. 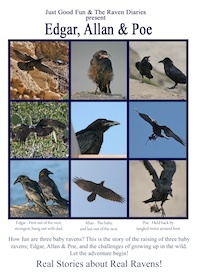 "Bob, Huey & Me" chronicles the couples escapades with both an adult crow (Bob) and then Huey the baby raven. "Bob Huey & Me" now available on Vimeo! 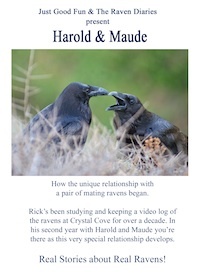 Rick likes to share most of his raven research through video, it helps keep him honest. So you, the viewer, are able to see, hear and share in the real story. We're human, and even the most sincere scientist, a prior bias can sometimes influence and change reality. Rick says,"books are great, but many times I find the truth stretched a bit to tell a better story and the truth is wild enough!" So in most all his films, The Raven Diaries chooses to use raw video and most, if not all, the actual sound track as it was recorded in the field. Yeah! Now you can get Raven Rick's Raven Diaries series on Vimeo! The Raven Diaries short films! These and other titles are available on DVD, Amazon Instant Video and Vimeo! 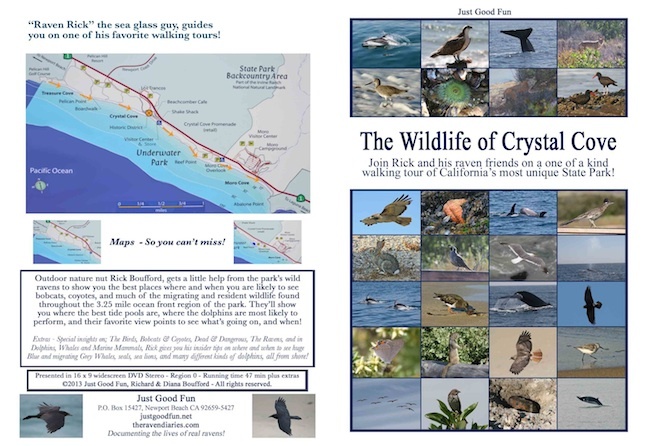 Below, in "The Wildlife of Crystal Cove" Rick and his Raven friends share their favorite walk in the park! The Raven Diaries movies are available on both DVD and Amazon Instant Video. See the Amazon Store for more details. The Grandest Raven Research Project Ever? The Raven Diaries is verifiably the most extensive and ambitious privately funded research project solely dedicated to ravens in the world! Decades of research and over a thousand hours of video of wild ravens from all over the western United States are just beginning to be reviewed and logged into usable formats. The most asked question ? 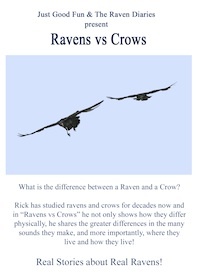 What's the difference between a Raven and a Crow? What's the difference between a Crow and a Raven? Your State and Federal Tax Dollars Not At Work! It's nice to live in a world where many are concerned and want to donate to further the education of all wildlife. Unfortunately, The Raven Diaries isn't set up to take donations. All funding for research is through the sales of it's numerous information and education videos, movies and books found at The Store and through their Amazon Store, and now all for one low price on Vimeo! So they appreciate those who want to help, and the best way is simply to purchase what you are interested in and to give them as gifts to help spread the word. Now! 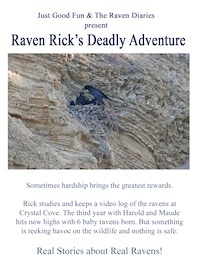 Get Raven Rick's Raven Diaries series on Vimeo! See an index to Raven Rick's videos on You Tube! Start with, What's the difference between a Raven and a Crow? Amazon shoppers, see all Rick's books, movies and how-to videos here! See all of Rick's educational videos on Vimeo! Raven Rick, also known as the sea glass guy! "Creating Community Through The Arts"